Mediterranean cities are constantly changing. The city of tomorrow will have to adapt to changes in society, focus on the needs of citizens and take into account the environment. 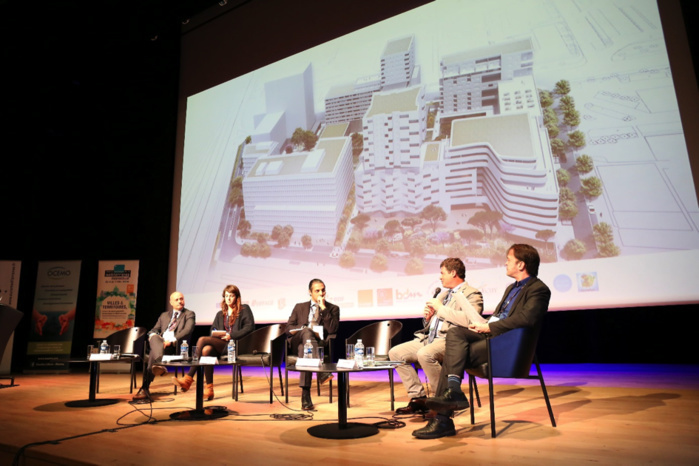 These are just some of the themes discussed at the opening session of the Mediterranean Economic Week organised by OCEMO and EPA Euroméditerranée on the topic of “The evolution of cities in the Mediterranean: from dream cities to real cities”. The event brought together experts from a variety of sectors, including sociologists, architects, operators, local authorities and major lending institutions, all of whom have a role to play in the city of tomorrow. For Philippe de Fontaine Vive, Co-Chair of OCEMO, Mediterranean cities must make it possible to “attempt better community living, with the cooperation of all, taking into account both the environment and social changes.” New technologies are at the heart of these changes. Cities now need to be smart and connected. According to Carlos Moreno, a scientist specialised in Human Smart Cities, “the notion of smart intelligence should not be understood from a technological point of view, but as a way of making cities into places for living and sharing.” Digital technologies are a source of inequality and social division. Cities therefore need to prioritise services over infrastructure, which requires three levers: technological innovation, urban intelligence and social inclusion. These levers are well integrated into “The Camp” project presented by Elisabeth Viola from La Caisse des Dépôts, which offers an experimental space for the city of tomorrow and its future designers. “It is important to develop open and cross-disciplinary systems for our work,” says Carmen Santana, an urban planner and architect. “Residents must be consulted before any designs. Whether we’re working in cities in the Mediterranean or elsewhere, organising forums and bringing communities together is essential. Connecting people can be understood from a geographical or decision-making point of view.” The UFO (Urban Fabric Organisation) start-up believes that gathering information directly from citizens to determine their needs and wishes is vital. Maud Beau, an urban planner and sociologist responsible for heading up this start-up, believes that “digital tools are transforming our ways of working. It is now possible to include civil society before an urban development project has been decided and designed.” The idea is simple. The application developed by UFO allows any local residents to easily and visually transform their neighbourhood in line with their needs and wishes, before sending the results to the start-up. The idea of community meetings has been specifically applied in the Bouregreg Valley in Morocco. Nadir Yacoubi is responsible for financial engineering and partnerships at the Bouregreg Valley Development Agency (AAVB), and explains that one of the urban aims of this project is to “achieve urban rebalance between the right and left banks of the river and to link up these two urban areas.” This extensive work is supported by design studies to ensure the best possible environmental impact.